You will need two vials of 5000 IU to complete the 43 days protocol. But if your weight loss goal is 15 pounds or less, you can do the 23 days protocol and you will need only one 5000 IU vial. During your 43 day protocol with HCG, mix only one vial at a time to ensure the potency of the HCG. Then after 23 days, discard the first vial and mix the second vial. Do not expose it to light. Exposure to light will cause the potency of HCG to deteriorate. Choose amber vial if you are buying it yourself. If it is a clear vial, wrap it with an aluminum foil or place it in an opaque container to preserve the hormone. Do not freeze the HCG. It may affect the potency of the hormone. Mixed the HCG only with bacteriostatic water. DO NOT mix two different liquids with your HCG. Use only the liquid that comes with your HCG. Dr. Simeons protocol calls for a minimum daily dose of 125 IU’s of HCG and a maximum dose of 200 IU’s of HCG. 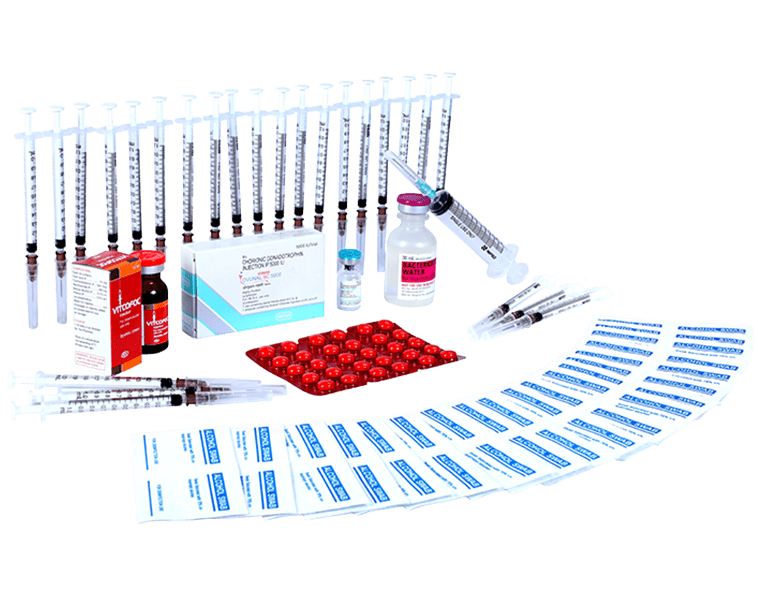 NOTE: HCG injection is different from HCG drops. They are not the same. You will not get the same lasting result when you use the drops as you will get when using the HCG injections. Remove the tops from the bac water and HCG vial then wipe it clean with the alcohol prep wipes. Insert the needle of the mixing syringe into the bac water to withdraw the solution. Use the chart below for mixing your HCG. Slowly add the bac solution into the HCG vial. Gently swirl the vial with your hand. DO NOT shake the vial. Let it sit for about 15 minutes.